A flood of students rushed their way to Andromeda Hall only to hear Shiv Khera on 9 January 2019. Shiv Khera is the author of bestselling books “You Can Win”, “Freedom is Not Free”, “Living with Honour” etc. Besides being known for a great motivational speaker all over the world, Khera has also helped countless people across the globe in steering off their life for a better change. 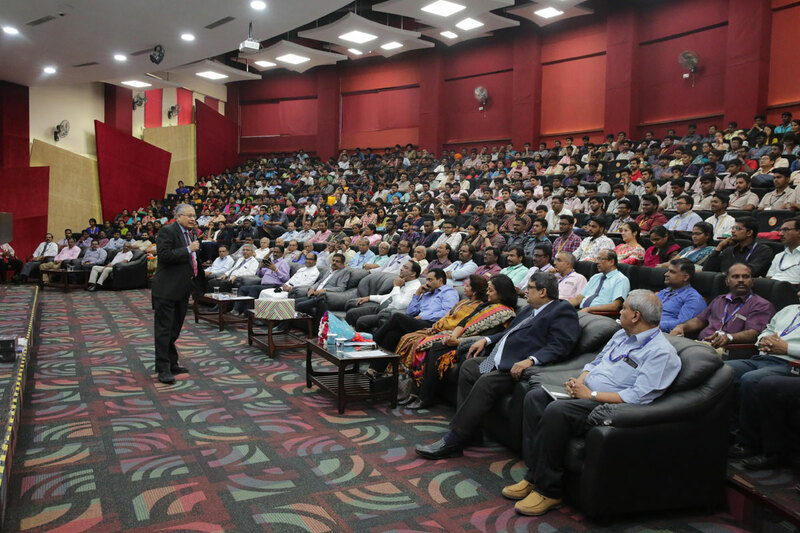 His session on the topic “Make Success the Way of Life” had uninterruptedly glued the jam-packed audience from Hindustan Group of Institutions in their seats for about 2 hours. Dr. Aby Sam, Director, HITS; Mr. Ashok Verghese, Director, HITS; Dr. K.P. Isaac, Vice Chancellor, HITS; Dr. Pon Ramalingam, Registrar, HITS; Dr. N. Vasudevan, Dean-Academics, HITS presided over the function. Khera stated that our social world is essentially made up of two kinds of people: the good and bad. As much as good people are viewed for their positive role and contribution to the society, the bad ones are seen as the liability or hindrances for social development. To be a successful person in one’s respective field, Khera outlined five key criteria—the physical strength, mental strength, emotional strength, financial strength and spiritual strength. All these five criteria are the fulcrum for transforming oneself into a successful person. The term “Success” though a cliché, has its own power and thrill said Khera. To him, success is not an absence of problem, but one’s ability to overcome it. In terms of our approach to the concept of wealth and money, Khera differentiates between the making of money and earning of money. Both are poles apart in their understanding of amassing wealth and money. According to him, “money making” is likened to the act of criminality and earning money is viewed as a clean way of transcending oneself by means of spiritual practice of sort; he further stressed on the need to create wealth ethically and not robbing off others’ by unethical means. Alongside Khera’s enumerating on these much sought after topics, he also spoke on three crucial skills necessary for a successful life such as people skill, persuasion skill and prioritizing skill are what it takes oneself to achieve great heights in life.